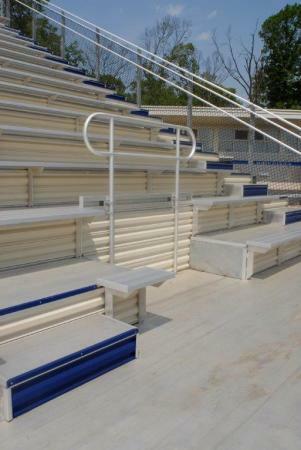 Wheelchair Accessibility | Compliance | Southern Bleacher Inc.
Southern Bleacher crafts its grandstands to be accommodating to all fans. 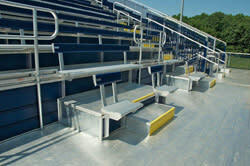 By doing so, your facility will be code compliant and need to have a minimum required number of wheelchair spaces. This is also known as &apos;companion seating&apos; in our contracts. At least one companion seat shall be provided for each wheelchair space, according to the International Code Council&apos;s &apos;2012 International Building Code®&apos; - Section 1108.2.3. Ramps used as part of a means of egress shall have a running slope not steeper than one unit vertical in 12 units horizontal (8% slope).